€74,000 outstanding payment! 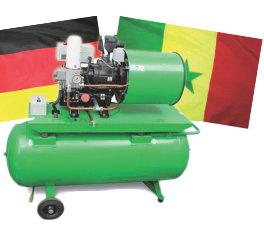 A German compressor manufacturer had been sending ceaseless reminders to its Senegalese customer, but without success. Two years of prevarication, time-wasting answers – in short polite refusals to pay the amount due. An apparent case of force majeure. In his defence the debtor claimed difficulties in making the payment due to the uncertain economic and political climate in Senegal, particularly after the presidential elections. It would be almost impossible for him to transfer currency out of the country. In view of all these delays and false alibis, Cabinet d’Ormane was asked to collect the debt as quickly as possible. Aware of the weakness of the Senegalese legal system, Cabinet d’Ormane preferred to go for an out of court settlement, whilst exercising continual pressure on the debtor, using every possible transactional recourse. It even encouraged the sale of land by the debtor, to enable him to have the money available to pay what he owed to the German company. Cabinet d’Ormane’s obstinacy got the better of the debtor’s delaying tactics. The Senegalese company paid an initial account to show proof of its good faith … But the second payment was delayed. With its perspicacity and determination, Cabinet d’Ormane found the debtor, who had moved in the meantime … After pressurising the company once again, Cabinet d’Ormane finally obtained total payment of the debt. This case illustrates Cabinet d’Ormane’s sense of realities and its persuasion, which can be adapted to every situation and country, using its expertise to collect debts on behalf of its customers.